Posted on December 5, 2018 December 5, 2018 by Meghan Barlow, Ph.D. Bringing home a new baby can be a stressful time for all involved. Follow these tips for helping older siblings adjust and to set the stage for positive sibling relationships. When older siblings have to wait for the baby to finish feeding, wake up, get to sleep, or have a diaper change, try to get them engaged in a fun or preferred activity. This becomes easier as the baby’s schedule becomes more predictable. When you know it’s about time to feed the baby, help your older child get engaged with a game or activity that they can occupy themselves with during the baby’s feeding time. You can figure out ways to do this even when you couldn’t predict the baby’s schedule. If you’re sitting down feeding the baby and your older child is getting restless or wants your attention, play guessing games like “I Spy” or “I’m thinking of an animal that’s really big and has a trunk…what is it?” For more active kids, you can give them “missions” to go on a hunt in the house and find different objects (“Your mission is to find a book with a bear in it!”). Some older kids are happy to settle and play nearby. If this is the case, you can reinforce their patient and flexible attitudes by using praise (“you are playing so nicely over there!”), giving them attention (“oh wow! Look at that tower you built!”), or allowing them to “overhear” your praise (you talk to the baby and say, “when you’re a big kid, you’ll learn to work hard on your towers, too! Your big brother builds and builds and builds – he figures out lots of cool ways to make towers!” or to your partner, “Today was a good day. Henry played so nicely, building his towers.”). 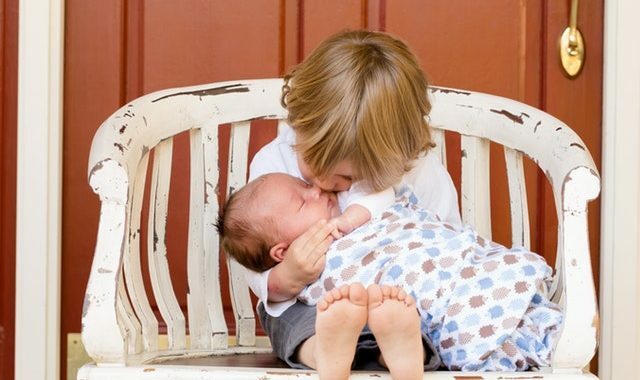 Most parents are concerned about how older siblings will feel once a new baby comes home. We recognize that there will be opportunities for jealousy or maybe feeling like your parents are ignoring you. Help your child understand those feelings. If you see your older child sulking in a corner (or acting up) as visitors come over to meet the baby, speak gently to your older child, and acknowledge that sometimes it’s hard when people care so much about a new baby, sometimes big brothers or sisters might feel a little jealous. If you have siblings, you can share a story from your childhood about a moment you (or one of your siblings) felt jealous and what they did. Lots of families have stories about a big brother demanding that his parents “return” the baby to the hospital. Pull some of those stories out and laugh a little. Then explain that a parent’s job is to love and take care of all of their children. Make a pact with your older child, “if you’re feeling left out or jealous, give me a code and when I see that I’ll know – Henry needs me to give him a little love right now.” Make up a code with your kid and practice it. Labeling feelings and communicating openly about them, as well as validating those feelings, will take a little tension away from the situation. If your child is silly and likes to goof around, you can transition into a sillier moment by adding, “oh, I forgot – a parent’s job is also to make sure their kids get plenty of tickles!” And then tickle. You can even then ask, “alright, now I’ve got twice the tickling to do – can you help me tickle the baby…except, until she’s a little older we just do this super lame-o air tickling above her tummy, like this…” and then you and big brother are in cahoots and working together again.